SOUTHINGTON - “[Pole vaulting] was something I never thought I was going to do,” Southington’s Megan Biscoglio said after finishing her indoor track season. 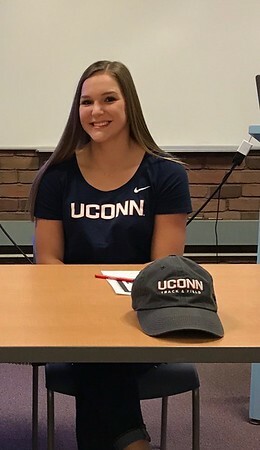 Yet she recently signed her Letter if Intent to compete in pole vault for the Division I University of Connecticut. This year, Biscoglio broke numerous records and claimed the Class LL indoor pole vaulting state title as well as tied for the best leap at the State Open, though she officially finished third at that meet. She cleared 12 feet, 2½ inches, which is the new indoor pole vaulting record at Southington High School. Biscoglio started pole vaulting as a freshman, after an injury that ended her gymnastics career. At first it was a lot of trial and error. She watched YouTube videos and tutorials to figure things out. Biscoglio owes all of her pole vaulting success to the nine coaches and instructors at Patriot Pole Vault in Massachusetts. The coaching staff includes Chris Combs, the Tufts University pole vaulting coach, and Douglas Lang, who was a pole vaulter for Tufts in 1992 and became a volunteer assistant coach at Tufts in 1996. His devotion to helping all levels of developing athletes has lead him to become a volunteer coach for Worcester Polytechnic Institute and UMass-Lowell. After working with the coaches at Patriot Pole Vault, Biscoglio’s career took off, literally. Biscoglio’s other options were Lehigh University, Bucknell University, UMass and Sacred Heart, but UConn seemed to be the right fit for her. Posted in New Britain Herald, Southington on Sunday, 25 March 2018 21:08. Updated: Sunday, 25 March 2018 21:11.